An artfully mastered golfer's paradise. Experience six championship golf courses. GOLF magazine continues to rank two of the Reynolds courses in America’s Top 100 and four in the top 10 in Georgia. But beyond the national accolades, Members simply enjoy great golf every day, a wide menu of association activities, informal groups and scheduled events year-round. Signature designs by Bob Cupp, Jack Nicklaus, Tom Fazio, Rees Jones and Jim Engh. Celebrate your love of the game as each course unveils its own unique identity. These perfectly suited golf packages were created to meet your every want and need, including an assortment of other coveted amenities. Explore the legacy of the Linger Longer Invitational. The man everyone wants to hit. Thoughtfully crafted by five legendary architects. 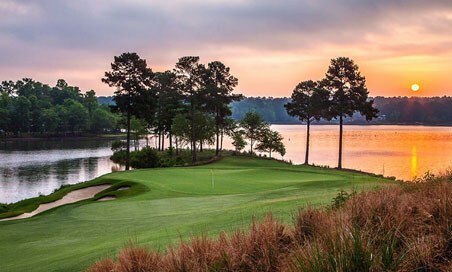 The golf experiences at Reynolds Lake Oconee combine variety, challenge and pure joy with a rare collection of courses that reflects each architect’s passion and character. Together, these iconic figures form a “Mount Rushmore” of golf architects, with their creative likenesses molded into every fairway, bunker and green at Reynolds. While Jack Nicklaus’ greatness as a player is unrivaled, he also has established himself as one of the greatest golf course architects in his more than three decades in the business. 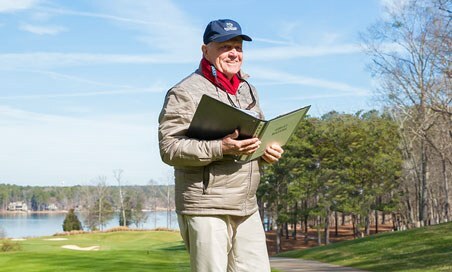 Nicklaus and his associates at Nicklaus Design have designed more than 400 courses in 36 U.S. states and 28 countries. Nicklaus Design courses have been ranked in various national and international Top-100 lists in Golf Digest, GOLF Magazine and Golfweek. Tom Fazio is unquestionably one of the most renowned golf course architects of his time and continues to remain a master of modern design. Individual honors include being named Golf Digest’s Best Modern Day Golf Course Architect — three times. In 1995, Fazio became only the second course architect to receive the highest recognition awarded by the Golf Course Superintendents Association of America: The Old Tom Morris Award. During a distinguished career of more than 45 years, Rees Jones has become one of the most celebrated course architects in the world. While he has designed more than 100 courses around the globe, he is also well-known for his redesign of courses in preparation for major championships, hence his nickname “The Open Doctor.” His skills have been applied to seven U.S. Open venues, five PGA Championship courses and three Ryder Cup sites, among others. Bob Cupp has long been established as one of the premier golf course architects in the country, having won Golf World magazine’s prestigious Course Architect of the Year award in 1992. Cupp worked for 16 years as the senior designer for Nicklaus Design before beginning his own design firm, where he assisted in making changes at Augusta National. At the forefront of design concepts that are steering golf into the new century, Jim Engh has brought his endless enthusiasm for the game and expertise in detail to The Creek Club at Reynolds. Symbolic of the innovative new breed of golf course architects, Engh is unconcerned with yardage yet committed to the preservation of quality shotmaking and determined to make the game enjoyable for everyone who steps onto the tee. Discover six truly distinctive golf experiences all in one location. Offering innovative technology and personal consultation, once available only to tour professionals, Reynolds Kingdom of Golf presented by TaylorMade has been reimagined and renovated to provide the ultimate experience for all recreational golfers with a true passion for the game. Indulge in unlimited golf with our signature Reynolds Ultimate experience, or choose from one of our other current offers to enjoy daily golf excursions and benefits, including practice facility access and dining.